Normally we are doing ship inspections or cruises on various cruise lines latest and greatest new builds. This past Saturday we did an inspection of a ship re-entering service that was built in 1990 and the Godmother was Miami’s own Gloria Estefan. Fast forward to August 6, 2016, 50 million dollars just recently spent on major upgrades and US ships starting to enter service doing cruises to Cuba. 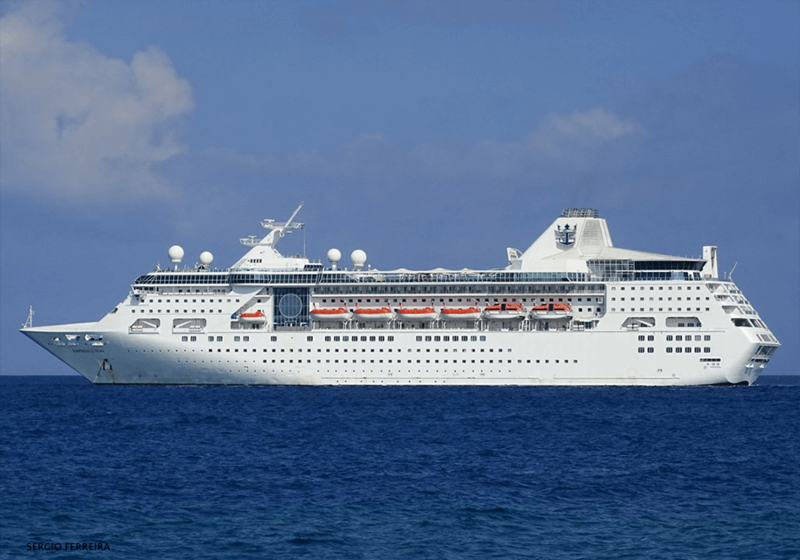 Royal Caribbean pulled this ship back from a sister company with the hopes of entering her into the Cuban cruise market as soon as possible. Royal, like others, is just waiting for the word from Cuba that the paper work is in order and that they can start offering cruises. Rumor has it that this ship will be doing a 5/5/4 night deployment however this is not officially confirmed. I find it most interesting that by pure chance Gloria Estefan a mega Cuban America Super Star was the Godmother nearly 26 years ago. Why this ship for Cuba? Simply put the infra-structure in Cuba can only handle certain size ships and this one fits. Royal has poured millions into the ship to bring her up to speed with their newer ship however there are limitations such as a very limited number of balcony cabins and not an over whelming number of public rooms. What I can say is that the ship looks and feels surprising good. One major reason is a very good refurb job and choice of colors and décor. But even more importantly is that she is a small ship, by today’s standards, of only 1,602 passengers on a ship of 48,500 tons and 692 feet long. This small ship feel is reflected in a can do staff that know they have to offer more, in their own way, than her mega sisters carrying 6,000 passengers. The crew and cruise line’s solution is to provide better food, really unique entertainment and personal service. In a very short time we experienced it all with the exception of the entertainment. The hotel manager made no bones about the fact that they are spending more money than the rest of the fleet on food and our luncheon proved this to be the case. 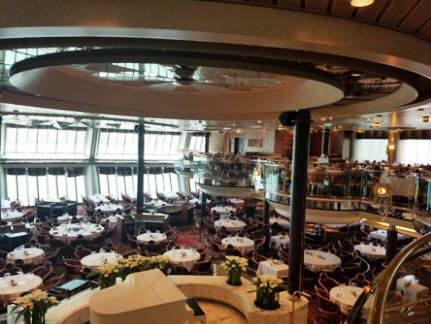 High lights of this ship in my opinion are the main dining room (Above left) which is two deck levels with floor to ceiling glass windows overlooking the stern of the ship. Totally elegant by any standards. 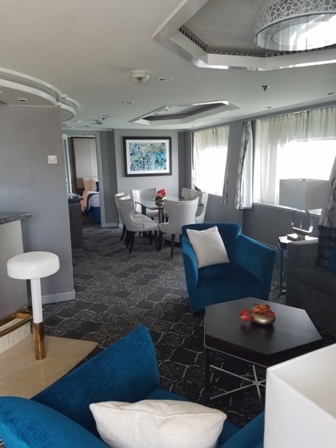 Boleros Lounge on the aft of the ship already has the Cuban Vibe with photos and a Cuban coffee corner and a fantastically warm and relaxing décor. These rooms are winners. This ship will really be all about a new unique destination, good solid service and better than average food with destination entertainment. I can’t wait to get more details on final itineraries and prices. Stay tuned. This report was prepared by Steve & Diana Bloss[954 452 8800 | sbloss@www.cruiseco.com]. The views expressed as solely those of the author and not necessarily those of WWTCA.